Four circular hardstone discs, each with a round hole cut to the centre, leaving apertures of varying widths. The largest agate slit ring is of translucent creamy white colour, while the inner edge is composed of two faceted planes, the sloped surfaces terminating into a pointed outer edge. The dark green moss agate ring similarly has two faceted planes on its inner edge, whilst the surfaces gradually terminate into a vertical plane. The brownish, semi-translucent agate ring also has an inner edge of two faceted planes and a pointed outer edge. 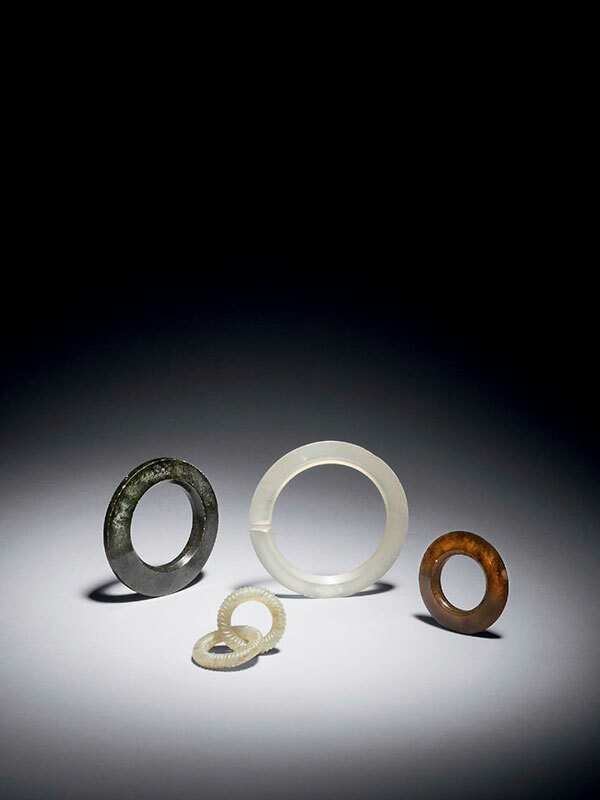 The smallest piece is carved from celadon, pale-green colour jade into a set of linked double rings. The surfaces of the rings are finely carved with parallel grooves. All pieces are smoothly polished, with some traces of calcification.